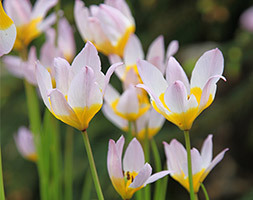 Bulb size: 5/7 Pointed pinkish-lilac petals open to yellow-centred star-shaped flowers, which top the slim stems in mid- to late spring. These lightly scented flowers, look wonderful in clusters threading through gravel gardens, rockeries or an alpine bed. This tulip is one of the few that do not need to be lifted each year as it will spread to form good-sized clumps.